PKS 1441+25 is one of the two most distant active galaxy detected up to such extreme energies. The very high-energy emission is attenuated on its way to Earth due to the interaction with the diffuse light filling the Universe, the extragalactic background light. This diffuse light retains the history of the stars and galaxies evolution and, hence, the story of the evolution of the Universe. PKS 1441+25 was used as a lighthouse to derive information on the evolution of the Universe from half its age up to the present day. Beside its distance, PKS 1441+25 is one of the very few Flat Spectrum Radio Quasars detected at such extreme gamma-ray energies, allowing to study its intrinsic characteristics. On April 2015, the Large Area Telescope detected an increase of the activity of PKS 1441+25 and MAGIC followed up the alert, discovering VHE gamma rays from the object. Some of the galaxies are called active, as they produce in their central parts much more light that can be explained by the stellar and dust emission. Active galaxies, hosting at their centers a supermassive black hole with a mass of million up to few billion times the mass of the Sun are amongst the most powerful objects of the Universe and dominate the gamma-ray sky: they are able to accelerate charged particles up to very high energies. Following a classification based on their luminosity and other astrophysical important features, PKS 1441+25 belongs to the Flat Spectrum Radio Quasars family and emits very energetic gamma rays from the vicinity of its central black hole. Flat Spectrum Radio Quasars are enigmatic sources and scientists struggle to explain the emission of VHE gamma rays from them, observations such as those performed by MAGIC give crucial inside into those sources. Gamma rays depict the extreme Universe, but such highly energetic emission suffers absorption in the journey to the Earth due to the interaction with diffuse emission, the extragalactic background light. The extragalactic background light acts as a sort of ‘haze’ which dims the gamma-ray brightness of distant galaxies. This ‘haze’ was generated by stars and dust throughout the history of the Universe. 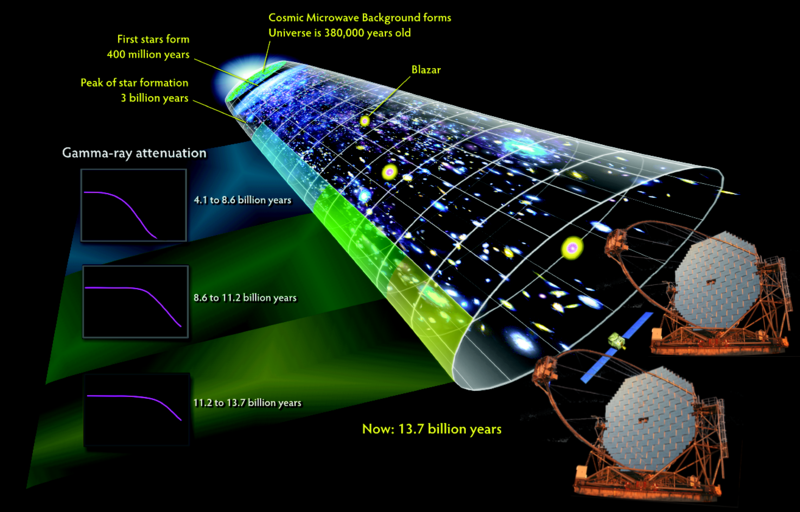 It traces the evolution of the Universe after the appearance of the first stars. In this context, powerful active galaxies, such as PKS 1441+25, can be used as distant lighthouses to infer the characteristics of the extragalactic background light between the Earth and the position of the active galaxy. The emission detected from the active galaxy PKS 1441+25 has been traveling for half of the age of the Universe. PKS1441+25 and QSO B0218+357, another source recently detected by MAGIC, are the oldest VHE gamma rays ever detected from ground observatories. In the paper published the 15th of dec 2015 in the AstroPhysics Journal Letters, vol. 815 L23, the current models of the extragalactic background light which constrain the evolution of the Universe from its middle age until today were tested for the first time up to energies never reached before for such distant galaxies.